The year 2008 changed everything for Waldameer and Water World. The wait was finally over as Waldameer once again had a giant signature roller coaster to attract thrill-seekers. Ravine Flyer II made a bold statement to everyone that Waldameer was not that same little park anymore. Attendance rose 20% in 2008, which has been maintained and exceeded ever since. As we all know how uniquely thrilling Ravine Flyer II is, the evolution and ongoing story of this roller coaster is like no other coaster in the world. Let's go back to 1993...Waldameer placed it's first deposit to build a signature ride. Ravine Flyer II would be the long awaited successor of Ravine Flyer; a coaster that operated from 1922-1938 which also crossed Peninsula Drive. 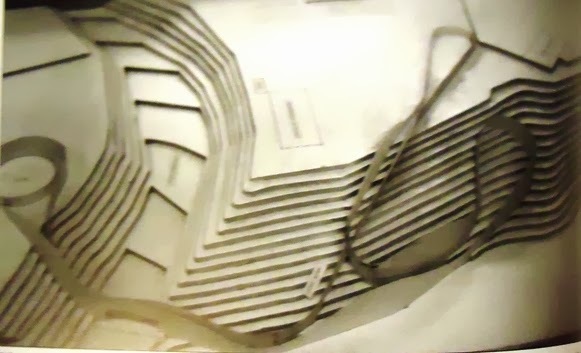 One of the earliest proposed layouts of Ravine Flyer II. A couple years later, a wooden coaster manufacturer, Custom Coasters International, came up with the proposed layout below. This design was the first "official" layout to be constructed for Ravine Flyer II's original target opening season, the year 2000. Looks a little closer to what Ravine Flyer II looks like today. During the longer than expected planning and approval process to build Ravine Flyer II, Custom Coasters International ceased operations in 2002. However, the ambitious project never missed a beat as it was taken over by a new roller coaster manufacturer, The Gravity Group, from Cincinnati, Ohio. In 2006 the final green light was given to Ravine Flyer II, and the current layout of the coaster was revealed. Construction was completed in 2008. 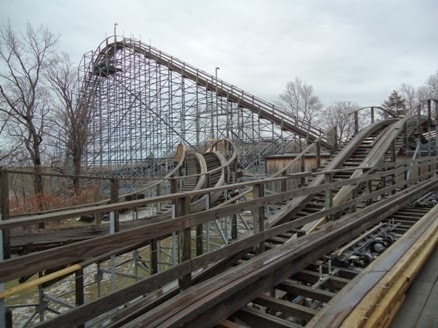 Ravine Flyer II as it stands today. Advances in wooden coaster engineering allowed for a more intense layout featuring a 90 degree banked turn as well a high-speed s-turn following the bridge. In September of 2008, Ravine Flyer II shocked the world by beating out a massive 230ft Steel Hypercoaster to win the Golden Ticket Award for "Best New Ride of 2008" in the entire world. Our Owner, Mr. Nelson, also won the very prestigious Golden Ticket Award for "Person of the Year" in honor of is passion and dedication in not only getting Ravine Flyer II built, but for his decades of successful service to Waldameer Park. It only took Ravine Flyer II one season to elevate Waldameer and Water World into the global spotlight. Fast-forward into present day, and Ravine Flyer II has been ranked as the 6th Best Wooden Roller Coaster in the World by Amusement Today each year since 2009, and most recently ranked #6 in the World by the 2013 Mitch Hawker Wooden Coaster Poll. Both of these rankings are the most prestigious roller coaster honors in the Attractions Industry. Ravine Flyer II patiently awaits for the 2014 Season to begin. Make sure you grab a safety harness and have a good pair of climbing shoes for Part 2! We will be exploring the results of some interesting activities that occurred with Ravine Flyer II in preparation for a thrilling 2014 season.